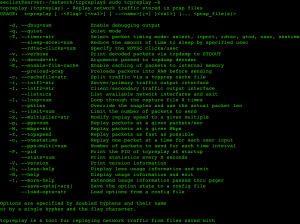 Browse: Home / tcpreplay is a suite of tools to edit and replay captured network traffic. Tcpreplay is a suite of free Open Source utilities for editing and replaying previously captured network traffic. Originally designed to replay malicious traffic patterns to Intrusion Detection/Prevention Systems, it has seen many evolutions including capabilities to replay to web servers. ← Punter – a passive domain hunter.